RIP Fat Burners are one of the strongest weight loss capsules available in the UK, developed to aid the metabolism of fat cells, suppress your appetite and increase the rate at which your body burns calories. RIP fat burners are ideal for anyone trying to lose body fat and tone up their appearance and when used in conjunction with a healthy balanced diet can produce amazing results for both men and women. 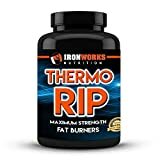 RIP fat burners can reduce bodyweight in a safe and effective way without any of the unwanted side effects of prescription diet pills.Energy levels are increased while taking these high strength fat shredding capsules. Made from natural and tried and tested ingredients here in the UK.When combined with a healthy fitness regime can produce that toned ripped look.Rapidly absorbed for fast effective weight loss. Take one capsule before breakfast with half pint of water and second capsule around 4 hours later with water.